Attention: This episode is dedicated to all the Bronies out there! Pixel Dan sits this episode out, as Stina takes over the show! Stina welcomes a special guest: friend Ricky, also known as Slave2EvilLynn on the He-Man.org forums! Stina and Ricky share a love for the My Little Pony: Friendship is Magic blind bag toys, so that is what this episode is all about! So be prepared for a trip to Equstria with Stina, Ricky, and Battle Derpy! And if MLP isn’t your thing, don’t hate! 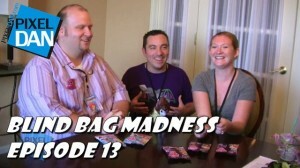 There will be another episode of Blind Bag Madness up soon! I found Fluttershy in series two. I open these with my 3 yr old daughter. I used to get them for her, but I have to admit its fun for me too. We managed to get all of the series 3 ponies. Can't wait to get working on the series 4 light blue bags with her. I guess I'm a brony!